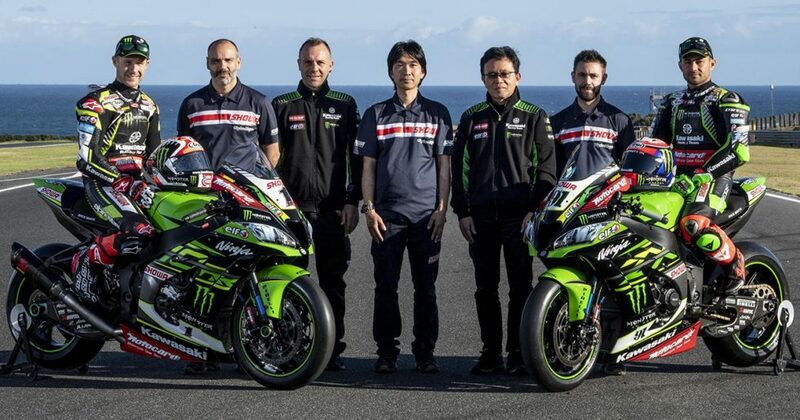 Having already worked very successfully with the Kawasaki Racing Team and its riders, SHOWA has increased its commitment to the successful World Superbike championship winning team for 2019 becoming amajor sponsor partner. At the opening round of the new championship at Phillip Island in Australia, Kawasaki’s WorldSBK race media officer, Gordon Richie, spent time with Horishi Ichimura Chief Operating Officer of the R&D Division, Tsutomu Kajino, General Manager R&D Division, Motorcycle Shock Absorber for SHOWA along with their colleagues who explained the background to the increased sponsorship profile and SHOWA’s wider ambitions in the field of suspension and suspension products. What does this new relationship mean to SHOWA? “With this announcement we will see SHOWA branding increased everywhere. Until now we have been concentrating only on the technical side, to develop new materials and new technologies. Now, for us, it’s important that everybody knows about the SHOWA brand. Already KRT is a strong team, so we thought, “Why not add more support and transmit the SHOWA brand to everybody through KRT?”.Our long term intention is that a team using SHOWA win every world championship race category. Of course we would not change our passion of supporting KRT, there is no change to that part of our philosophy”. You have had great success with Jonathan Rea with four consecutive world championships and with KRT in general. How much of an input has SHOWA had in that success and how important is it for you to build on it and increase it in the face of greater competition? Given that there is a cost cap on what can be charged to customers for forks and shocks in WorldSBK is this business sustainable? If a competitor based their business model on profit inside the paddock then our business model is different. Our main business is production parts, and its quantity production on a huge scale. Generally this kind of small amount prototype production is not our main business. But when developing our advanced technology we race first and then apply to a production bike such as the Ninja ZX-10RR later; we have enough valuable feedback from racing to work this way. In the past other suspension companies used to dominate in WorldSBK, now SHOWA is the dominant force. It seems if you run SHOWA you can fight for a win. How was that done? “We used to be in MotoGP and had highly advanced technology. Ten years ago we started our journey with the KRT team in WorldSBK, we thought we still had some advanced technology from MotoGP and that would be useful for KRT. It was not just about suspension though, as KRT already had quite good technology for the chassis side, suspension side, and of course collaboration with Kawasaki Japan. In those times we did not think we were losing out to our competitor but maybe that was a perception from people outside, because maybe not so many people were using SHOWA at that time”. How big is SHOWA on the motorcycle side…between the road and racing divisions? How many people cross over between the two. Are you bigger than your rivals? “The Company itself is large, because we have R&D center in Japan, India, other Asian countries, America and Europe, and we have quite a lot of people involved in production bikes. In our racing side it is not hundreds of people, ten to 20, something like that. We are still on the same floor of the office as the production guys, and we can easy to talk to each other”. For racing you need more servicing as the forks and shocks work so hard, but on the street this is not the case. How much can you take from racing to the street without having to have a SHOWA technician coming to your house every few months? “Already the BFF front fork has been implemented on the street bike Kawasaki, but not exactly the same material. We also have to think about durability and take into account the bigger – and many more – bumps you experience on the street. And of course – as you say – we cannot visit all end users to do maintenance check every few months! In this point of view, we cannot transfer exactly the same material to the street bike, but the basic technical functionality, and the idea, is very similar. All street riders maybe cannot feel 100% of the sensations from the track situation.. but I think all the riders can feel the difference if the suspension is better – that is the SHOWA philosophy”.